News Years day was a rather glorious affair, 24 degrees and blue skies. The kids were off on an outing with their aunts, my partner headed in to town for a coffee, book in hand; and I ventured to our local patch of bush for some solitude. 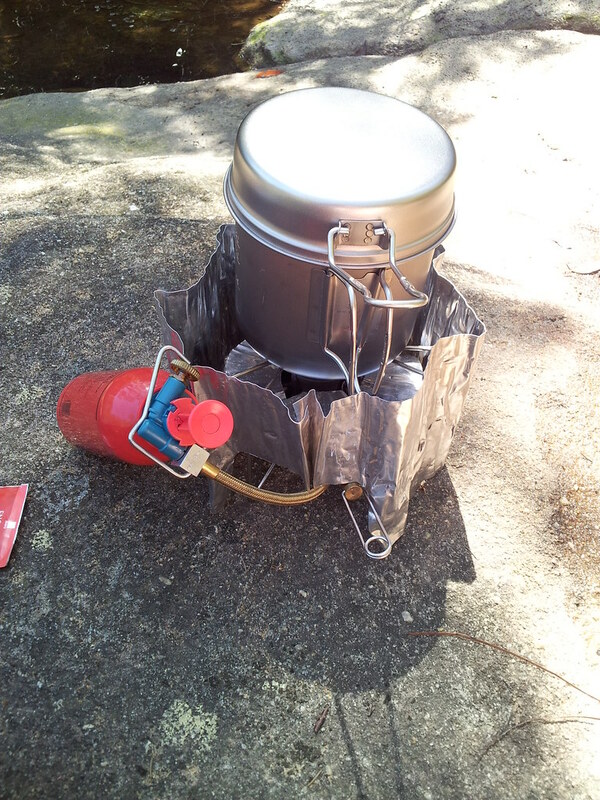 In my pack I had two new cooking pots, which I thought I would try out. The pots in question are the Snowpeak Trek 1400 and Trek 700 titanium range. These were purchased for an upcoming trek in New Zealand. 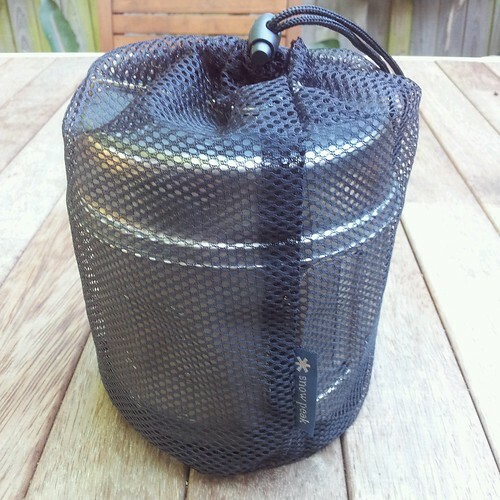 With the idea of upgrading my cooking pots (have an old Sigg set, similar to Trangier) I headed to Kent Street in Sydney and checked out the camping stores, drifting from one shop to the next. Mountain Equipment was the store that impressed me the most with regards to having the broadest range of brands on display. 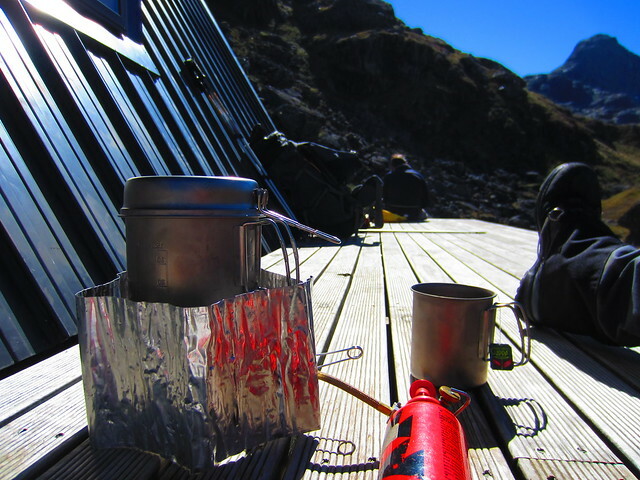 The Snowpeak Trek 1400 and Trek 700 pots struck me as being an ideal solo cooking set. I wavered between different sets made of varying material but kept returning to those two pots, it was a gut reaction however; the rational side of my brain was shouting out the cost. Titanium gear is very expensive and perhaps attracts the gear junkie or Ultralight back packer mob. It wasn't really my intention to buy titanium cooking pots and after I exited the shop I was contemplating the rationality of spending so much money on this gear when for a third of the price I could have left with high end stainless steel or aluminium equivalents. If weight was a real concern, I have 5 kilo that I can shed before contemplating uber light equipment. So why buy this gear, well I'm a fan of beautifully designed and durable equipment that will last a lifetime and that's what snared me in the end. I also liked the fact that the pots were compact and stacked together with a minimal pack footprint. When I walked out the store I was praying that my gut instinct had not led me to an expensive blunder. The shop assistant had corroborated what I had read beforehand that titanium whilst light, strong and hard wearing was susceptible to hot spots when cooking, which could result in food sticking or burning to the bottom if you were not vigilant. 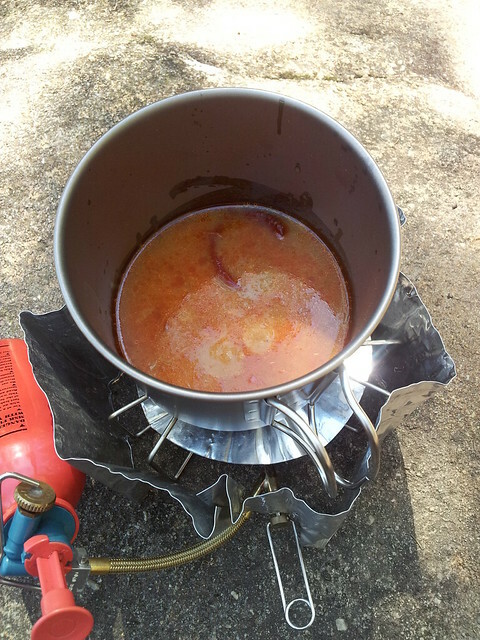 My main stove is an MSR Dragonfly which has an excellent simmer control so I was hoping that this issue would be reduced or eliminated altogether. Now before I proceed any further it would be useful to touch upon the history of the manufacturer. Snowpeak is a Japanese company and the two pots have made in Japan stamped on the bottom! The website indicates that the company started in 1958 under the leadership of Yukio Yamai, an accomplished mountaineer. A scan of outdoor forums indicates that Snowpeak products are held in high esteem. I couldn't find a bad word against their equipment. The Trek 700 stacks neatly inside the 1400. 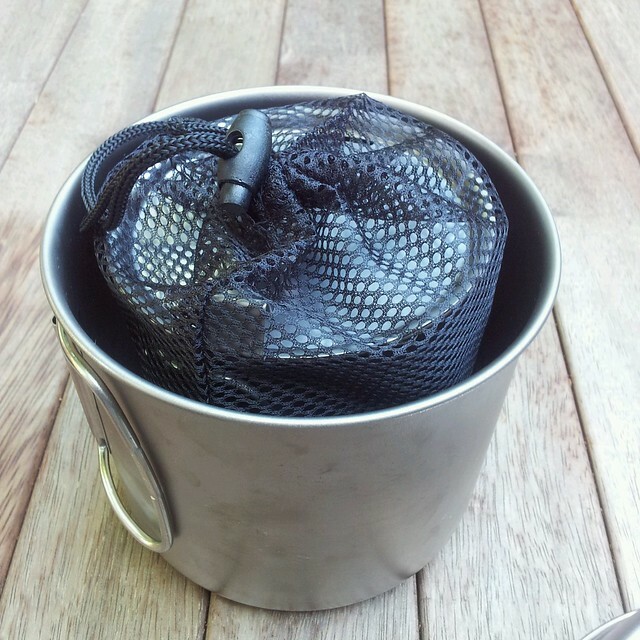 Both pots have a mesh bag, time will tell if the bags are durable. The Trek 1400 weighs 133 grams (4.7 oz) and the Trek 700 136 grams (4.8 oz), combined weight is 269 grams 9.3 oz. 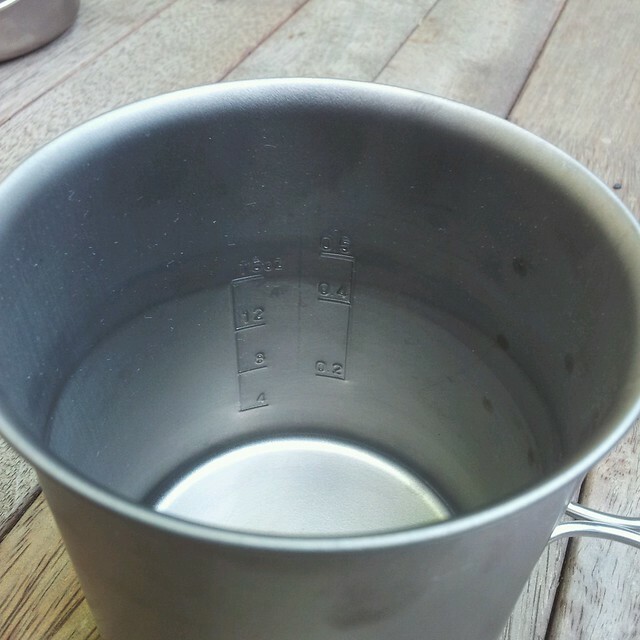 Nice features for both pots are fluid measurements printed on the inside of the pots. 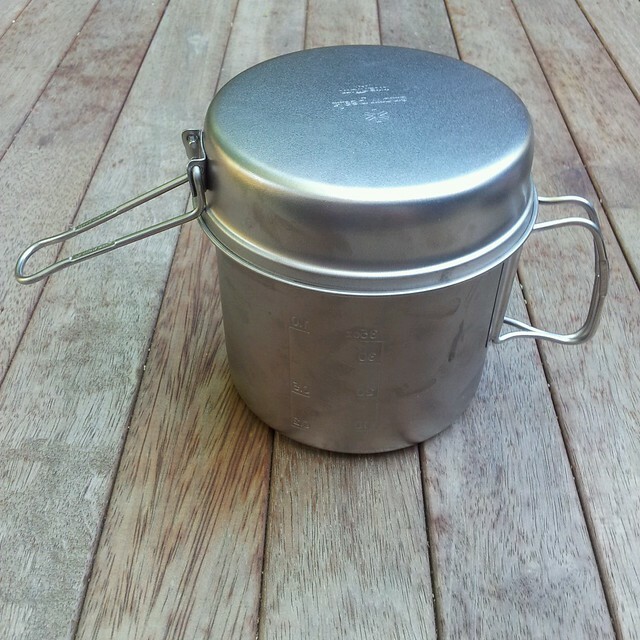 The Trek 1400 is sold with a small pan that also doubles as the lid. 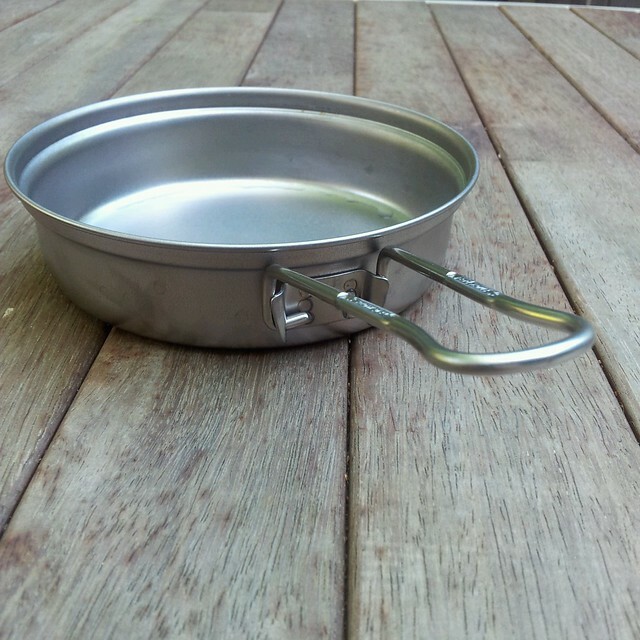 Both pots and pan have simple folding handles. On the pan the handle locks in place, on the pots the handles fold flush with the pots. I have now used the pot set three times on treks and can report that whilst the handles on the pot do warm up after bringing water to boiling point, I can comfortably remove the pot from the stove without the use of a glove or cloth. food sticking to the bottom of the pot has not been an issue. I'm not sure if this is due to the superb simmer control on the MSR Dragonfly stove, my attention to cooking or that hot spots on titanium pots is not really a major issue. Indian Dahl: it tasted a lot better than it looks!!! The Trek 700, is similar in proportions to a military Crusader style pot. It would be possible to use this to cook small dishes such as noodles or soup. One issue which I was aware of before purchasing is that the diameter of the Trek 700 pot is too narrow to safely sit on the MSR Dragonfly pot stand, although suitable for most gas stoves. This is not an issue for me as I intend to use if as a tea/coffee and soup/noodle cup. A great feature of the Trek 700 is a strainer hole in the lid, useful for draining pasta noodle style dishes. So in conclusion, I am really happy with this pot combo, without question this will become part of my everyday camp cooking kit. It's incredibly light, beautifully made, durable and functional. UPDATE: Back from a trek in New Zealand where I had the opportunity to use the Snow Peak gear day in day out. It has confirmed in my mind, that this is brilliant equipment that has the perfect balance of being lightweight and durable. Thanks for your comprehensive review and clear photos. The low weight of the pots is impressive and I particularly like the look of the fry-pan lid, which appears to be constructed very nicely. I also like the attention to detail that has gone into the Trek 700 and its lid. 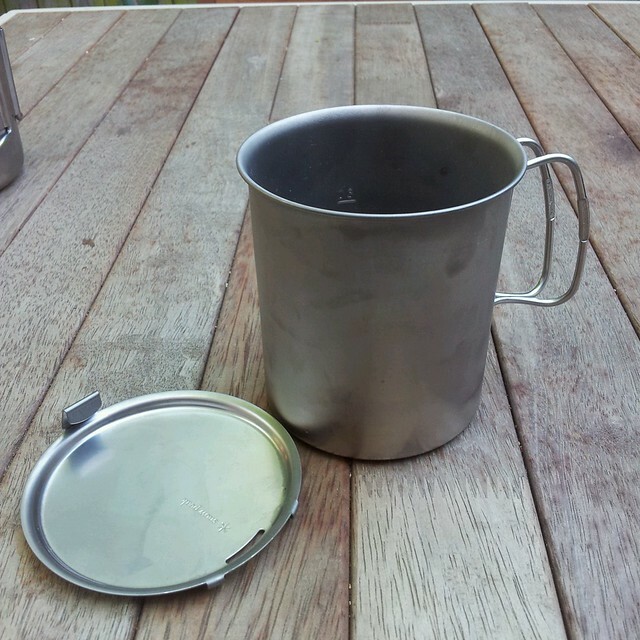 This would make a useful lightweight, solo hiking pot along with a small gas burner. Thanks Paul, glad the review was helpful. It really is a great piece of kit. I've got your RSS in my feeds now. Looking forward to your next post. Is the Dragonfly able to "stack" inside the Snow Peak 1400? I ask because I'm thinking of making that my backpacking set. The stove itself not the fuel canister obviously. I will check today. I don't do that due to the possibility of a fuel taint. I suspect it would. I am trying to get a foil flame wind guard something like the one in your photos. That one came with my MSR, but I did buy a back up from Macpac about a 10 months ago. Paddy Pallin would probably have them also.